THE SOUTHERN ROUTE 18 FREEWAY: In the late 1950's, the New Jersey State Highway Department legislated the construction of two freeways to link the New Brunswick area with north-central New Jersey shore communities. The state plans, which called for a north-south, NJ 18 Freeway from Bound Brook to Eatontown, and a north-south, NJ 35 Freeway from Long Branch to Seaside Heights, were endorsed by the Tri-State Transportation Commission in its 1962 regional expressway plan. The NJ 35 Freeway, which is on new alignment, is needed to provide a route with freeway characteristics that will relieve the existing NJ 35. The present land-service road, most of which is three-lane, is congested and hazardous due to traffic generated by army installations, shopping centers and coastal resorts. In addition to bypassing heavily developed areas, the freeway will provide connections to NJ 38 (today's I-195 and NJ 138), NJ 33, NJ 66, NJ 18 and the Garden State Parkway. The southern terminus will be at the Brielle Circle, in the vicinity of Shrewsbury Borough. The proposed NJ 18 Freeway will connect existing land-service NJ 18 and US 9 in Old Bridge with the Garden State Parkway and the proposed NJ 35 Freeway in Eatontown. The NJ 35 Freeway, a north-south route through urban Monmouth County, will provide an alternate route for trucks along the Garden State Parkway corridor, and an overload route for peak recreational traffic along the North Jersey shore. The NJ 18 Freeway, an east-west route through Middlesex and Monmouth counties, will fill a gap in the existing expressway grid, provide an alternate route for trucks along the Garden State Parkway corridor, and an overload route for peak recreational traffic to North Jersey shore resorts. This route will serve a fast growing suburban area, and tie into New Brunswick to strengthen renewal efforts. Most urgent is a new bridge across the Raritan River to relieve existing congestion. The proposed four-lane freeways through Monmouth County were designed for a capacity of 30,000 to 50,000 vehicles per day (AADT). It was to be built to full freeway standards, with a 300-foot right-of-way and a 60-foot-wide median. Completion of the NJ 18-NJ 35 freeway complex was originally scheduled for 1975. Construction began in 1965 on a 6.7-mile segment between EXIT 6 (NJ 138 and I-195, formerly NJ 38) in Wall Township and EXIT 11 (Deal Road) in Ocean Township. This section opened between 1967 and 1972. During this time, the northernmost section of the NJ 35 Freeway between Eatontown and Long Branch, and the southernmost section of the NJ 35 Freeway between Brielle and Seaside Heights were both cancelled. Subsequently, in 1973, the newly opened section of NJ 35 Freeway was re-designated NJ 18. The newly combined NJ 18 Freeway was to be a 48-mile, north-south route from the intersection of NJ 34, NJ 35 and NJ 70 in Brielle to I-287 in Bound Brook. New environmental regulations and funding limitations soon formed a roadblock for the progress of the NJ 18 Freeway. Although the most of the NJ 18 Freeway right-of-way had already been acquired by 1970, designs for much of the freeway had not yet been submitted. In 1973, after work on new overpasses began in Monmouth County, the Federal Highway Administration ordered the NJDOT to cease construction, pending environmental studies. Future sections of the NJ 18 Freeway would therefore be subject to state and Federal environmental design and impact studies. Upon completion of these studies, work resumed on the NJ 18 Freeway. The section between EXIT 15 (Wayside Road) in Eatontown and EXIT 30 (US 9) in Old Bridge was completed in 1979. Another one-mile section, between EXIT 11 and EXIT 12 in Ocean Township, opened in 1987. The missing link in the southern NJ 18 Freeway between EXIT 12 and EXIT 15 was joined in 1991 with the completion of the massive Eatontown interchange (EXITS 13-15), where the NJ 18 Freeway meets the Garden State Parkway and NJ 36. According to the NJDOT, the southern section of the NJ 18 Freeway carries approximately 30,000 vehicles per day. The speed limit along this section is 65 MPH. THE NORTHERN ROUTE 18 FREEWAY: In 1962, the state made official plans to develop the NJ 18 corridor as a freeway between US 1 in New Brunswick, Middlesex County and US 22 in Bound Brook, Somerset County. The 8.3-mile, four-lane freeway, which had a design volume of 30,000 to 50,000 vehicles per day (AADT), was estimated to cost $44 million. The proposed alignment along the Raritan River was to include a new span across the river between New Brunswick and Piscataway. This section of the NJ 18 Freeway will run from US 22 in Bound Brook to New Street in New Brunswick. This north-south artery is needed to provide improved access to New Brunswick, a new crossing of the Raritan River, and connections to I-95, I-287 and NJ 28. Ultimately, it will serve inter-regional traffic in the corridor from north-central New Jersey to the north Jersey shore. The State Highway Commission is authorized as soon as practical to add to the state highway system a new route beginning at existing NJ 18 in New Brunswick, and taking a northwesterly direction generally parallel to the Raritan River, crossing the river in the Leupp Lane-Methars Lane area, crossing I-287 west of Possumtown Road in Piscataway, and continuing north to US 22 in Bound Brook. Construction of the new Raritan River span began in the late 1960's, and by 1970, three massive piers that were to be used to support the bridge were in place. However, the rest of the NJ 18 Freeway extension was subject to new Federal mandates requiring the drafting of environmental impact studies. These studies delayed construction for more than a decade. Through New Brunswick, the most significant controversy arose over a section that would have obliterated the Delaware and Raritan Canal, which had been abandoned in 1932. The canal was the first one to be used by steam tugboats, the first to use telegraph lines to warn lock tenders upstream of approaching barges, and during its heyday, carried more than 200 barges per day through its 12 gates. Environmentalists and historic preservationists feared the loss of the canal along the Raritan River. In contrast, civic officials and local corporations such as Johnson and Johnson (whose new headquarters would be constructed by the freeway) supported the freeway extension, contending that it would offer an opportunity for redeveloping New Brunswick. In 1977, the NJDOT was granted a Federal permit to begin construction of a 2.3-mile section of the NJ 18 Freeway from New Street in New Brunswick north to the intersection of Middlesex CR 514 SPUR (River Road) and Metlars Lane in Piscataway. These plans allowed for the completion of the Raritan River Bridge, which was renamed the John A. Lynch Memorial Bridge. To mitigate the environmental damage caused by the freeway, a park was built atop a deck spanning one section of the road behind three Rutgers University dormitories. Bikeways were constructed between the freeway and the parallel Raritan River. The four-lane NJ 18 Freeway through New Brunswick opened in 1983 at a cost of $40 million. According to the NJDOT, the northern section of the NJ 18 Freeway carries approximately 40,000 vehicles per day. There is a 55 MPH speed limit along this section of freeway. EXTENDING NORTH TO PISCATAWAY: In 2001, the NJDOT approved the reconstruction of NJ 18 as part of its five-year capital program. The four-lane extension follows the route originally proposed in 1962, along the Metlars Lane-Hoes Lane alignment. However, only a 1.5-mile-long section was built as new freeway; the remaining 2.6 miles was built as an arterial. The newly extended NJ 18 will end at I-287 near Possumtown Road, about three miles south of its originally planned terminus at US 22.
milepost 43.61 to 45.15 ("Section 2A"): From River Road to Hoes Lane Extension, the NJDOT built a freeway on new alignment along Metlars Lane. 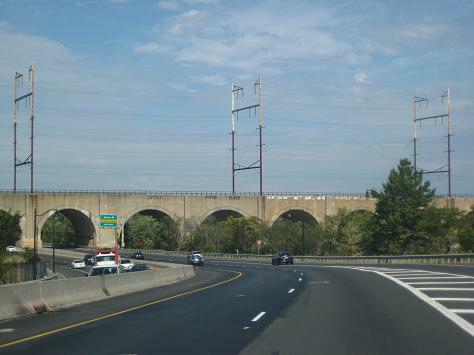 Grade-separated interchanges were built at River Road (partial cloverleaf), Frelinghuysen Road ("trumpet") and Metlars Lane / Davidson Road Extension (partial cloverleaf). The extension required the acquisition of seven acres of the Rutgers Ecological Preserve, and 30 additional acres from the Busch Campus of Rutgers University. In exchange, the NJDOT returned 7.2 acres that it had acquired through eminent domain back to Rutgers, and announced that it would construct new gateways to the Busch and Livingston campuses. Moreover, the NJDOT acquired 12 residential properties and three vacant lots along Metlars Lane, in advance of the project. milepost 45.15 to 47.79 ("Section 3A"): The NJDOT will widen the existing Hoes Lane Extension to I-287 at Possumtown Road to a four-lane arterial. The project entails consolidating traffic signals, improving shoulders and sidewalks, and upgrading drainage and utilities. To date, the NJDOT has not acquired any land along the route. Construction of the $85 million project is intended to alleviate congestion along local roads. Section 2A began in June 2002, and was completed exactly two years later. Work is expected to continue on section 3A through 2010. Currently, traffic between the present terminus of the NJ 18 Freeway and I-287 uses Middlesex CR 514 SPUR-River Road. NJ 18 is to be widened from six to eight lanes over the 1.2-mile-long section from NJ 27 south to NJ 172, creating a 2-2-2-2 configuration for local and express traffic. From NJ 172 south to US 1, a third travel lane will be added in each direction to the existing NJ 18. However, traffic lights and at-grade intersection will remain. Four new bridges and one new pedestrian overpass will be constructed to accommodate the both the express lanes and the new collector-distributor (C/D) roads. The $170 million reconstruction project, which began in 2004 and is expected to continue through 2008, required the demolition of 11 homes. Route 18 is supposed to be extended south along the proposed route shown on maps. However, according to what I was told by one of the veteran mosquito employees, there is a large farm that the plans have Route 18 going through. The owner refused to sell, but supposed his children will sell once the owner dies. The problem is the owner supposedly intended to leave the land not to his children, but to some environmental group, specifically to keep Route 18 off the farmland. The co-worker at the commission knows this because we have done some ditching on a stream next to the farm. In 1998, I was actually at that farm, checking the stream for blockage. In 2001, the NJDOT replaced the Brielle Circle with a four-approach signalized intersection with supporting ramps that allow motorists to travel between NJ 34, NJ 35 and NJ 70. The NJDOT did not include a provision for the NJ 18 Freeway extension at the new intersection, nor have they included this extension in their statewide transportation improvement plan for 2025. Hopes for the "Brielle extension" may have been dashed once and for all. On May 13, 2003, the NJDOT opened a "trumpet" ramp from eastbound NJ 138 to the northbound NJ 18 Freeway, taking part of the right-of-way for the freeway extension. Three days later, state officials held a press conference with the Tri-State Transportation Campaign (an anti-highway group) to announce the use of the NJ 18 Freeway right-of-way as a four-mile-long bicycle path. THE CENTRAL ROUTE 18 FREEWAY? Between 1953 and 1955, an 11.2-mile section of NJ 18 was reconstructed between New Street in New Brunswick and US 9 in Old Bridge. This section of NJ 18, originally known as "Memorial Parkway," is a four-lane divided boulevard with some grade-separated intersections. Throughout the 1950's and 1960's, the New Jersey State Highway Department expected that this section, which features heavy commercial development, would be upgraded to full freeway standards at a future date. New connections were to be provided in East Brunswick at the New Jersey Turnpike (I-95), and at the (unbuilt) NJ 74 Freeway. However, this NJ 18 Freeway extension plan was abandoned in the mid-1970's. The NJ 18 Freeway should be extended south to Brielle. In the map above, nycroads.com contributor Scott Colbert illustrates a new "Brielle interchange" between NJ 18, NJ 34, NJ 35 and NJ 70. SOURCES: Regional Highways: Status Report, Tri-State Transportation Commission (1962); "Location of State Route 18: Engineering Report," New Jersey State Highway Department (1965); "Proposal for a Central Jersey Expressway System," New Jersey State Highway Department (1965); Transportation 1985: A Regional Plan, Tri-State Transportation Commission (1966); New Jersey Highway Facts, New Jersey Department of Transportation (1967); "Environmental Analysis and Report for Route 18 Freeway Extension," New Jersey Department of Transportation (1972); "Old Raritan Canal Is Focus of a Classic Dispute," The New York Times (4/16/1977); "Two Long-Disputed Projects To Begin" by Walter H. Waggoner, The New York Times (7/09/1977); "Route 18 Freeway Extension Project, Administrative Action Draft Environmental Impact Statement and Section 4(f) Statement," Federal Highway Administration and New Jersey Department of Transportation (1984); "Study Backs Adding Lanes to Route 18" by Frances Carroll, The Home News Tribune (2/06/2000); "Route 18 Extension Causes Relocations" by Sally Goldenberg, The Daily Targum (2/24/2000); "Council To Discuss Route 18 Changes" by Sally Khurshid, The Daily Targum (3/23/2001); "DiFrancesco Backs Plan To Expand 65 MPH Speed Limit," The Associated Press (8/15/2001); "Route 18 Environmental Assessment," New Jersey Department of Transportation (2001); "Rutgers OK's Extension for Route 18" by Sarah Greenblatt, The Home News Tribune (2/02/2002); North Jersey Transportation Planning Authority; Leo Auray; Chris Blaney; Phil Case; Scott Colbert; Lou Corsaro; Frank Curcio; Raymond C. Martin; Christopher G. Mason; Dan Moraseski; Jim Poserina; Michael Romero; Brad Stratton; William F. Yurasko. NJ 18 exit lists (northern section and southern section) by Ray Martin.